It's like getting your first Big Wheel all over again  and you don't even have to pedal. An innovative bicycle-design concept derived from the old-fashioned penny-farthing, the YikeBike is a folding electric bicycle out of New Zealand. 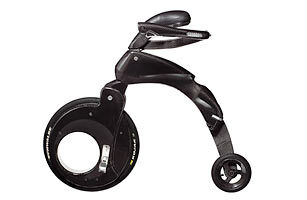 The rider sits on the seat, holds on at the sides and zooms around at a top speed of 12 m.p.h. (20 km/h). You lean left or right to steer, and it even comes with electronic antiskid brakes. The first 100 YikeBikes will be road-ready by mid-2010 in New Zealand as well as the U.K. and selected other countries in Europe.